Pico Rivera is a dusty working-class Latino suburb of Los Angeles. After the school district, Wal-Mart is the city’s largest employer and the source of 10 percent of its tax revenue. More than 500 families in the town depend on income from the store. The town is also the epicenter of activism by Wal-Mart workers in the United States. Walmart associates have been fighting for four years to pressure the world’s largest private employer to grant its workers decent conditions, a living wage and regular hours. Last fall, I flew to Los Angeles to interview Pico Wal-Mart workers for a book I’m writing about the 21st-century struggle by workers worldwide for a living wage. The Pico workers helped to galvanize that movement by organizing the first strike against a U.S. Wal-Mart in 2012. Since that time, the world has seen expansive organizing by garment workers, farm workers, fast food and retail workers from Capetown to Canada, Bangladesh to Brazil and Cambodia to California. The labor conditions and free market ideology that today’s low-wage workers are reacting against bear many resemblances to those faced by labor activists a century ago. And the workers involved have played on those historical resonances. Bangladeshi garment workers invoke the memory of Jewish and Italian immigrant women workers killed in the Triangle Shirtwaist Factory fire of 1911. Activist fast food workers carry “I am a Man” and “I am a Woman” signs, echoing the Memphis garbage workers strike of 1968. The Pico Wal-Mart workers carried photographs of the Woolworth strikers of 1937 when they sat in at an L.A. Walmart in 2014. At the same time, this is a 21st-century movement. Activists make use of cellphones and Facebook and Snapchat to organize and publicize their actions. For me as a labor historian, this contemporary movement with historic echoes is fascinating and powerful. That is what drew me to interview activists in the movement. As I got to know the Pico workers, I quickly learned that the personal cost of their activism has been high. Most have been fired or laid off. Local families have been donating food and clothing to those who now have no income. Still, the activists are committed to making change. Many are in Bentonville, Arkansas at this year’s shareholders’ meeting to present a petition to Walmart executives demanding their reinstatement. Simply put, what Wal-Mart does matters. Wal-Mart is the world’s largest company and the largest private employer on Earth. It employs 1.4 million in the U.S. and 800,000 in 27 other countries on five continents. The only larger employers are public – the U.S. Department of Defense and the Chinese army. As a result of its staggering size, Wal-Mart has tremendous influence on wages, labor standards, environmental standards and the national trade deficit as well as global trade policy. Labor activists, global trade analysts and economists talk of “the Wal-Mart effect.” By some estimates, Wal-Mart’s imports from China alone have cost 400,000 Americans their jobs between 2001 and 2013. The sheer volume of its purchases enables the company’s buyers to successfully press suppliers to lower their wages, labor costs and safety standards in order to lower their prices. This has had wide ripple effects, driving down manufacturing wages both in the U.S. and abroad. The second largest private employer in the world is McDonald’s. Their workers have also been leaders in the global fight for a living wage. Earlier in May, 10,000 workers from across the U.S. staged a civil disobedience camp-out at the McDonald’s annual shareholders meeting in Oak Brook, Illinois. They are currently voting on whether to unionize. Corporate spokespeople insist that salaries, benefits and opportunities for advancement open to Wal-Mart associates are competitive with other major corporations. 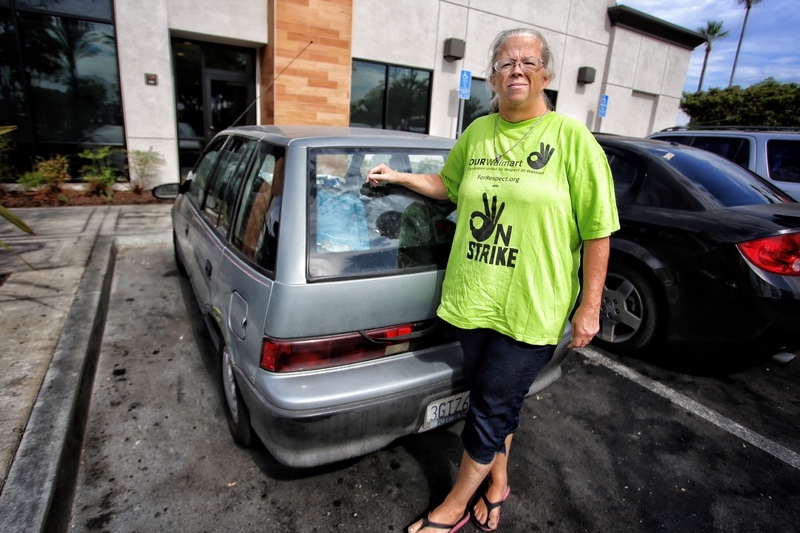 Former Pico Wal-Mart associate Jennie Mills has been living in her car for two years. She parks across from the Wal-Mart where she used to work, sleeping in the little hatchback with her husband and their cat. I met her at the nearby Denny’s where employees let the couple wash up every morning in the restaurant bathroom. Her son also worked for the Pico Wal-Mart, doing lifting and stocking shelves. When he was injured on the job, he was told by his manager to continue working. Injured again, this time more seriously, he could no longer do his job. He was, she says, unceremoniously laid off. Since that time Jennie Mills has been a militant OUR Wal-Mart activist. She wears the group’s neon green T-shirt proudly. Though Wal-Mart workers have been organizing across the U.S. and around the world – Chile and China have been particularly militant – Pico’s Wal-Mart associates helped start it all. In fall 2012, Denise Barlage and co-workers Venanzi Luna and Evelin Cruz led the first strike against a Wal-Mart in the United States. Unionized Wal-Mart workers from Italy, Uruguay, Chile and South Africa flew in to support them, walking them back into the store when the strike ended so that managers could not harass or fire them for striking. That same year, pregnant Wal-Mart workers from California to Maryland also began challenging the stores’ labor policies, Girshriela Green of the Crenshaw store in South Central Los Angeles told me. When Green reached her last trimester of pregnancy, she asked her manager for lighter work. This was the first job she had been able to find since coming off welfare, she told me, and she really liked it. Still, she did not want to risk losing her baby. Her manager’s response was not what she had hoped: Take an unpaid leave or “do your job.” At that time, Wal-Mart made no accommodations for pregnant workers. Injured while lifting stock, Green saw no choice but to continue working. She couldn’t afford to lose her paycheck. Repeatedly asked to stock bulky, heavy items, she says she ended up with dangerous bone spurs in her throat, and had to take a leave. She was sitting on her living room couch in a neck brace when the call came telling her she’d been fired. That’s when she decided to join Organization United for Respect at Wal-Mart, better known as OUR Wal-Mart. Green reached out to other pregnant Wal-Mart workers. They formed a group called Respect the Bump. With the help of the National Women’s Law Center, Respect filed a complaint against Wal-Mart with the Equal Employment Opportunity Commission. They charged violation of the 1978 Pregnancy Discrimination Act. Before the complaint could be fully litigated, Wal-Mart announced a change in policy. It would now make accommodations for pregnant workers. But the changes in policy were not enough to stop injuries on the job – even after the Supreme Court’s 2016 UPS decision ordering that company to make accommodations for pregnant workers. Respect is continuing to fight and to sue. She and other workers put tape over their mouths bearing the word STRIKE. The tape was meant to illustrate Wal-Mart’s attempts to silence workers, Barlage and Luna told me. The strikers held up pictures of the Woolworth sit-down strikers. They felt they were making history. At first, the pressure seemed to yield results. In Spring 2015, Wal-Mart announced that it would be raising wages for 500,000 of its lowest-paid workers to US$9 an hour by April 2015 and $10 an hour by 2016. There was a quick shareholder backlash and dire predictions about how these wages would affect corporate profits. Then, in April 2015, corporate headquarters suddenly closed five stores in four states, laying off 2,200 workers without warning. Pico Rivera was among the stores closed. Venanzi Luna told me she came to work that day and found the doors locked. No one saw it coming, she said. Full-time workers and some part-time employees received 60 days severance. Many did not qualify. Wal-Mart claimed that most workers who wanted transfers to other stores were given that opportunity. Luna says that is not true and that none of the transferred workers were members of OUR Wal-Mart. Management claimed the stores were shut down to repair plumbing problems. OUR Wal-Mart and allies in the United Food and Commercial Workers said it was punishment for the militancy of the Pico workers. Wal-Mart has a history of shutting down stores to punish strikers. In 2013 and 2014, the National Labor Relations Board (NLRB) ruled that Wal-Mart was illegally intimidating and sanctioning workers in retaliation for their organizing. Workers at the five closed stores filed Unfair Labor Practice complaints. In November 2015, in time for Black Friday, the Pico Rivera store was reopened. None of the OUR Walmart activists was rehired, Luna and Barlage told me. Venanzi Luna is still out of work. “I was suicidal for a while,” she said, despondent at the thought that her activism had left her neighbors without income. “People came over to me and said ‘If it wasn’t for you, we would still have our jobs.’” Recently, when Luna tried to shop where she used to work, she says that she was recognized, stopped and escorted out by security. In December 2015, OUR Walmart began lobbying the United States Congress to investigate the corporation’s labor practices. In January 2016, after filing repeated Unfair Labor Practice complaints with the National Labor Relations Board, Wal-Mart workers won two major victories. First, a National Labor Relations Board judge ruled that Wal-Mart had violated federal law by firing activist workers and had to rehire them. One of these was Evelin Cruz. Getting her job back won’t stop her speaking out, Cruz says. On May 3, 2016, the NLRB cited Wal-Mart for firing and disciplining activist workers in 10 states. Wal-Mart store managers were also required to read aloud to employees the federal government’s ban on retaliating against workers for organizing. 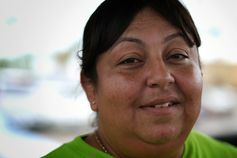 On May 30, she flew to Bentonville for the Wal-Mart shareholders’ meeting to speak out on behalf of the many workers she says Wal-Mart has illegally fired for organizing. It is the fourth year in a row she has done so. Fast food workers are also pushing McDonald’s to pay a living wage and give its workers regular hours. Bangladeshi garment workers marched this May for higher wages and staged a global day of action against the global clothing retailer H & M to demand it make its Bangladeshi factories safe from fire and building collapse. Migrant berry pickers are protesting child labor in the fields owned by the “world’s berry company,” Driscoll’s. “We started a revolution that has spread around the world,” Venanzi Luna told me proudly. She may be right.